E-Marketing in Minneapolis David Vinge, eMarketing Dashboard: Should You Pay Bloggers To Talk About Your Brand? Should You Pay Bloggers To Talk About Your Brand? 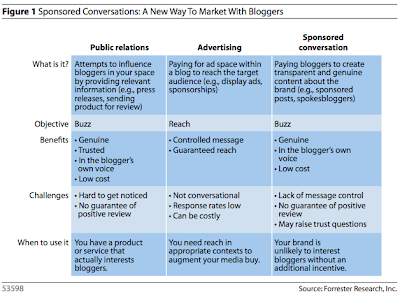 Forrester Research just released a new brief about “Sponsored Conversations.” The briefing suggests that advertisers should “Add Sponsored Conversations to Your Toolbox”. More and more blogs are participating in some form of sponsored conversation or sponsored blogging. The tight economy and resultant push for more efficient methods of advertising are driving bloggers and advertisers to explore this option more everyday. Since display ads don’t work in social media perhaps an "advertorial" will work. It has worked for other media. Printed magazines run paid advertorials, forms of advertising that incorporate editorial elements such as headlines and quotes and read like an article. While these are generally labeled as advertising the online magazines do the same but the separation of editorial and ads is less clear. Paid product placement in TV and Movies is common without any mention of sponsorship. Economic pressures will continue to tear down the wall between advertising and editorial departments even in our once sacred blogs.